The Feast of the Exaltation of the Holy Cross (also known as Roodmas) is a solemnity which celebrates three distinct historical events: the finding of the True Cross by St. Helena, the retrieval of the sacred relic by Emperor Heraclius in 629 from the Persians and the ineffable powers of the instrument of Christ's redemptive sacrifice and our salvation. "Consider, O Emperor, that with these triumphal ornaments you are far from resembling Jesus carrying His Cross." The Emperor then put on a penitential garb and continued the journey. This offers a lesson of humble service which fits into the lesson of Merciful Love associated with the Holy Cross . The Church exalted the Holy Cross just as Moses lifted up the Bronze Serpent in Exodus and those who looked upon it lived. Jesus willingly sacrificed Himself so that we all may enjoy eternal life. 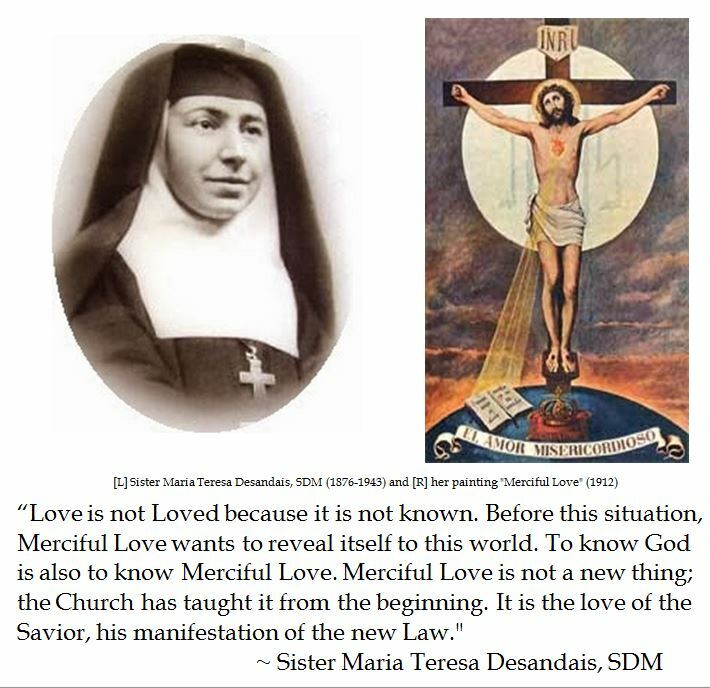 In the early 20th Century, Sister Maria Teresa Desandais was blessed with mystical experiences about Jesus' Merciful Love. She wrote about these experiences under the pseudonym "Sulamitis PM". In 1912, Sr. Desandais, who had no training in painting, was inspired to create the picture "Merciful Love" which depicted Christ crucified looking towards heaven with a host in the background with the initials JHS. Rays of light emanating from the Sacred Heart of Jesus illuminate a Bible laying at the foot of the cross turned to the passage "Love one another as I have loved you" alongside a crown. That is an incredible amount of symbolic meaning suffused in one scene, particularly for an amateur painter. This message of Merciful Love was widespread in France and Spain after the First World War. To bolster devotion to Merciful Love, Sr. Desandais sent two of her paintings to Spain. The painting sent to Juana Lacasa effectively became a place of pilgrimage. The other painting was installed at the Royal Basilica of Our Lady of Atocha in Madrid where Sister Maria Teresa's order was attached. It is quite conceivable that the message of Merciful Love of Jesus with the exhortation to be servants who love one another may well have influenced Pope Francis for the Year of Divine Mercy. Holy Father, through the Immaculate Heart of Mary, I offer to you Jesus, your beloved Son, and I offer myself in Him and through Him, and with Him for all your intentions, and on behalf of all creatures.